December is finally here! If you’re hosting on the 25th and the thought is filling you with more panic than festive cheer, Creamline is here to help. We’ve got some handy tips and advice on preparing early for Christmas, so you can relax and enjoy the festive season, knowing everything has been taken care of. There are plenty out there! Keep an eye out for a special or interesting recipe that will have your pudding the star of the show or convert even the most stoic sprouts-haters. Speaking of which, we’ve got a handy home recipe of our own for delicious Brussels sprouts here. If your order magnificent roasts from Creamline, you’ll also receive a complimentary cooking guide to achieving the perfect roast! 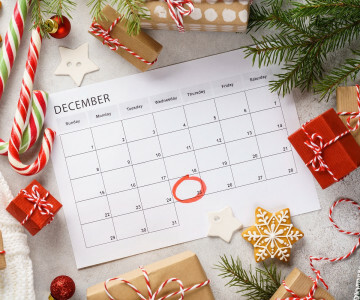 This may seem like an obvious one but planning a full shopping list at the start of December, with everything you need, will avoid any panic runs to the shop later down the line. Although the turkey will need to be set to roast first thing Christmas morning, there is plenty you can do beforehand to save too much hard work on the day. Cook things in advance that freeze well, such as stuffing, bread sauce, and even gravy! The gravy can be defrosted on the day, with the juices from the turkey added for the finishing touch. Let Creamline do the hard work for you! With free, next-day delivery, we’re here to make life a little easier – avoiding those last-minute dashes has never been easier! We’ve got a spectacular Christmas range on our website, including seasonal roasts, hand-prepared and ready-to-cook, premium cheese, chocolate and more. Have a browse here – and don’t forget to use your LoveLocal code for 50% off! Rain didn’t stop play for Didsbury Festival!